Each of the 12 astrological zodiac signs is associated with a “Quadruplicity” – Cardinal, Fixed, or Mutable – with four signs in each sector. 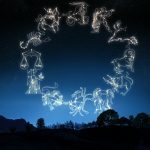 Just like every other aspect of Astrology, the Quadruplicities of the Astrological Zodiac Signs influence the characteristics and internal values of that sign in very particular ways. The three Quadruplicities of the Astrological Zodiac Signs are Cardinal, Fixed and Mutable. They are also sometimes referred to as the three “qualities,” “modes,” or “modalities.” Below, we have provided a list of the signs within each quadruplicity. As you may have noticed, there are four zodiac signs within each quadruplicity. There is one sign from each element within each quadruplicity – each sector including an Air sign, an Earth sign, a Fire sign, and a Water sign. We will outline the main differences between the Quadruplicities of the Astrological Zodiac Signs here, but please feel free to check out our articles on the Elements and Polarities of the Astrological Zodiac Signs, all of which also contribute to the differences between each sign. The Cardinal signs of the astrological zodiac are Aries, Cancer, Libra and Capricorn. Cardinal signs are easy to remember if you think about the seasons: Aries kickstarts Spring, Cancer begins the Summer, Libra starts Autumn, and Capricorn begins Winter. They are the initiators and the pioneer energies of the astrological zodiac. Cardinal signs exude the energies of action, enterprising, new beginnings, and vitality. These signs take initiative and like to be in control. As each sign in the Cardinal quadruplicity is a different element and polarity, what they desire to initiate and control varies between them. Aries, a fire sign, likes to be the leader and “firestarter” in most areas of life, just as they are the leader of the zodiac year. But Cancer, a water sign, has an innate desire to be in control of emotions and domestic matters. Libra, an air sign, wants to be in control of social environments and partnerships. And Capricorn, an Earth sign, naturally craves to control material matters and physical aspects of the world. Signs in the Cardinal quadruplicity thrive on being independent, working unsupervised, and managing their own success. They may even surprise you with the eventual outcome of their efforts – whether it be in their career, love life, or basically any other area of life. Cardinal signs also have a competitive streak, and like to be the best or “first” in whatever they do. They are very proud of, and value, their unique ways and methods of doing things. Depending on the sign, this passion for initiation will show in the traits their sign possesses the most of. The Fixed Signs of the astrological zodiac are Taurus, Leo, Scorpio and Aquarius. Fixed signs in the astrological zodiac are exactly that in most aspects of life: fixed (which explains the stubborn stereotype these signs carry). They appreciate and emanate the energies of routine, dependability, morality, tenacity, and inflexibility. These signs are not fond of change in their environment, as they have a strong need for stability and security. Of course, each sign in the Fixed quadruplicity has a different element and polarity, so what they desire to stay fixed with varies. Taurus is fixed in regard to the material world: material comforts and self-indulgence are something they will probably not compromise on. Leo is fixed in their behavior and sense of authority, while Scorpio tends to have fixed emotions, (regardless of whether they are positive or negative, there is no in between). And finally, Aquarius is typically fixed in their self-image and personal opinions. Signs in the Fixed quadruplicity strive to achieve solidity and only things which will last. They have a strong sense of purpose, which lends itself to an intrinsic nature that is steady, persevering, determined, self-reliant, opinionated, and hard to distract from their task or goal at hand. Think of it this way: the Fixed signs are all in the middle of each season. They take the energy the Cardinal signs initiated at the start of the season and create something of foundational value before the change coming at end of the season. The Mutable signs of the astrological zodiac are Gemini, Virgo, Sagittarius and Pisces. Signs in the Mutable quadruplicity are the ones to come shake it up a bit before the end each season. Some characteristics associated with Mutable signs include: adaptability, love of change, spontaneity, flexibility, constant movement, evolution, strong communication skills, attention to detail, open-mindedness, and being hard to pin down – literally and figuratively. Gemini demonstrates the power of change through intellectual processes – they change their mind, ideas and direction very often. Virgo shows the power of change in their daily life; a natural born perfectionist. Virgo can change course quickly, whether the goal is simply to stay organized, create a better method, or to selflessly help another. Sagittarius reflects the power of change through new knowledge – they enjoy change through new experiences, travel, learning, philosophy, adventure, and spirituality. Pisces expresses the power of change in their emotions; this sign has strong empathic capabilities and can adjust their feelings to those around them (sometimes to a fault). The Mutable signs of the astrological zodiac possess a very accepting and willing attitude towards change. These wise and “old souls” ebb and flow, and would rather adapt than remain in stagnant stability, (which makes life boring). They are also able to vibe with anyone or any situation, adjusting their personality easily.